On August 31st 2014, MojaveDolphins hosted the annual global protest- Japan Dolphin Day for the second year in a row. This is a peaceful event that is used to bring awareness on the slaughter of small cetaceans that goes on for several months beginning on September 1st in Taiji, Japan each year. The dolphins are driven from the ocean, into the infamous cove where two things can happen: The beautiful young ones are selected for captivity, while the others are slaughtered for their mercury contaminated meat. 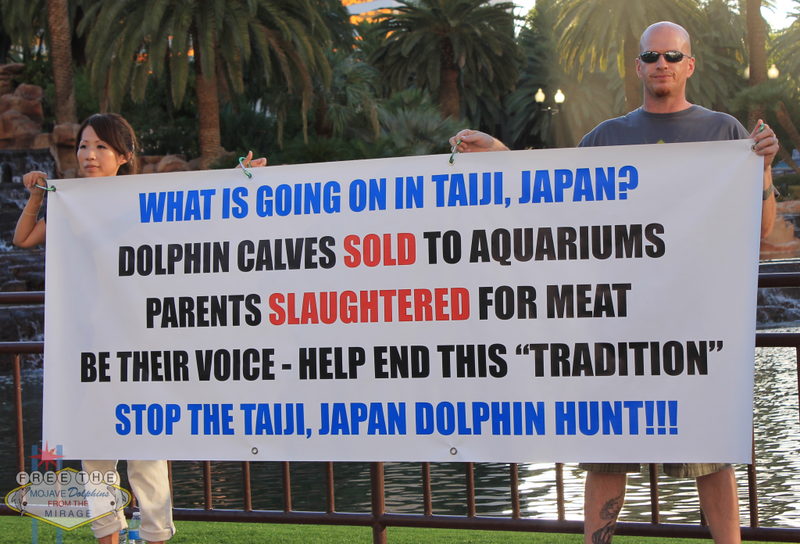 Most protests are held at the local Japanese embassies, while others take to dolphinariums and crowded public spaces. 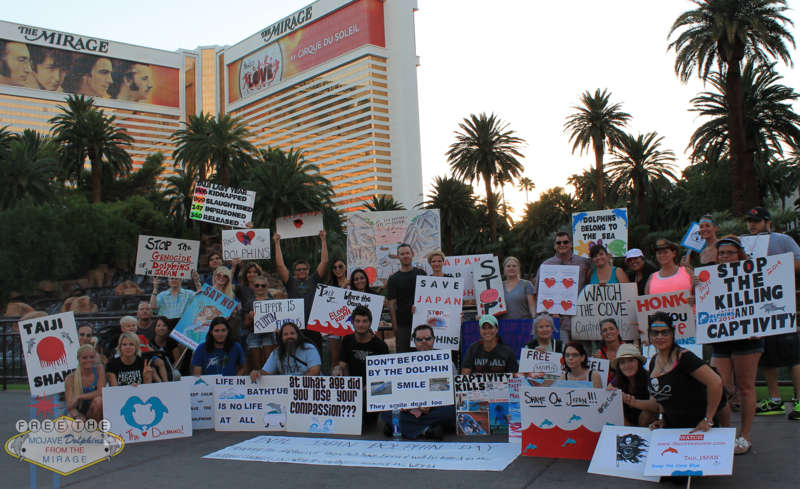 We had around 40 protesters braving heat of over 100 degrees gathered outside of the Mirage. Several traveled from California, Utah and Arizona to spread awareness about the plight of our ocean friends. Our signs were colorful and drew the gaze of the drunk tourists passing by. We were able to get 70 letters to the World Association of Zoos and Aquariums (WAZA) signed, along with passing out over 200 informational leaflets. This was a big step up from last year, where we only had 12 people. Our biggest accomplishment though was gaining the attention of not one, but TWO local news outlets. 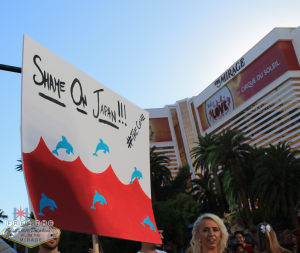 The Las Vegas Sun reporter was very excited to cover the Japan Dolphin Day story and wrote the article- “Demonstrators protest dolphin captivity at the Mirage“. They captured some great photographs of our team members in action. 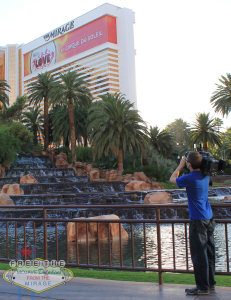 KTNV Action 13 News‘s Jacqui Heinrich responded to the tweets we have been sending and came down for a story about the Mirage. 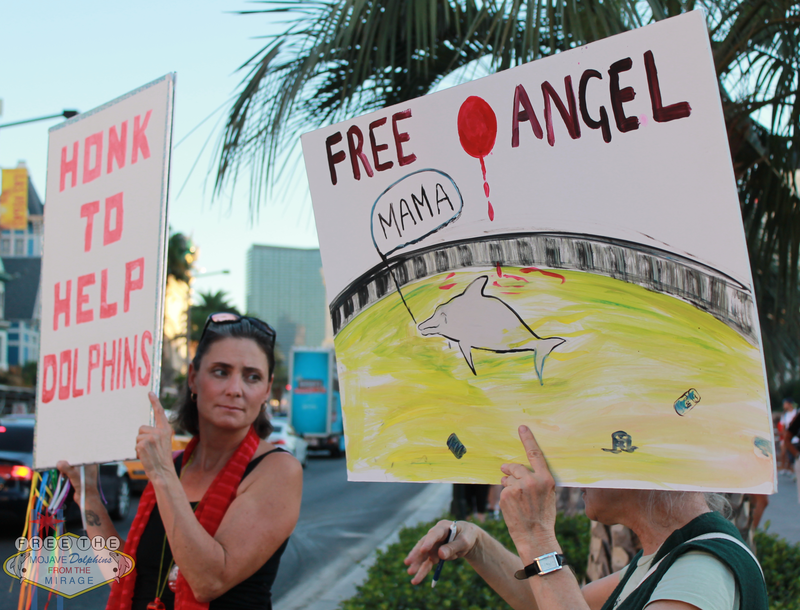 She produced “Protesters rally to improve care for Mirage dolphins with skin disease“. Her article was also ran on the television at 11pm that night, and several times the next day, with a ticker all day long across the bottom of the screen.This is the first time in many years that the Mirage dolphin habitat has been put on display in local media in a negative light. We are making waves in this small desert town. We must continue to put pressure on this place. Please comment on the news articles with a small thank you for covering the story if you have time. It wasn’t just our event that saw a jump in success, but the entire event was one of the most successful ever. The official numbers are 95 events in 39 different countries around the world. With over 15,000 participants, SJD is amazed at the level of creativity activists are having. So please, pat yourself on the back. Whether you were able to attend an event or not, this is happening because people like YOU are sharing the information. If there was not an event in your area this year, think about creating your own next year. All it takes is one person. Liberate, then Celebrate: A New Era for Dolphin Compassion. To view all of the photos from our event this year, please visit our facebook album. Post by Free the Mojave Dolphins from the Mirage Las Vegas.